The Nike Air Wild is available at an affordable price point. A handful of buyers applauded that they have several colorways of Air Wild to choose from. The Nike Air Wild generally runs true to size. Many users complimented the striking rubber outsole for its excellent grip, especially on wet surfaces. The comfortable ride this pair delivers was commended by many reviewers. Many liked the stylish and modern design of this pair. One even reviewed that the Air Wild is an understated sneaker. Few users praised the easy to maintain upper of the Air Wild. Many users expressed their amazement that this pair is lightweight. Numerous buyers shared the high-quality materials used in the Air Wild. Few reviewers criticized the tad narrow width of the Nike Air Wild. A couple of reviewers did not like the chunky profile of this shoe. The Nike Air Wild features an outdoor-oriented look with the comfort of a sneaker. It has rugged features of the early ACG added with luxurious leather accents. 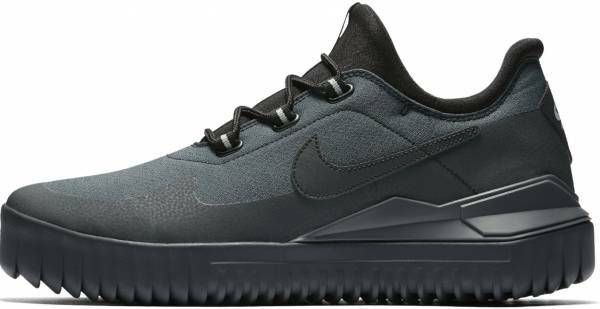 This Nike low-top shoe with a rough and ready look in a contemporary sense also makes the Nike Air Wild a smart choice for cruising the city. Whatever path the wearer may take, this kick is a perfect companion from the light trail down to the concrete jungle. Few consider the Sneakerboots as the evolution of the sneakers which lies between the comfortable sneakers and the heavy hitting trail boots. Its history began in the early 80s from the Nike Hiking line. It first released models such as Magma, Gore-Tex-clad Approach, Lava Dome, and Escape. Before, running shoes and hiking boots were from different entities. Running kicks were made with breathable mesh or suede with cushioned sole units with lack of heel and ankle support. Meanwhile, the traditional hiking or working boots utilized waterproof leather upper, rigid construction and heavy-duty rubber sole. In 1989, the All Condition Gear (ACG) was launched as the subsidiary of the Nike that produces gears and footwear for any climate situations. This line featured non-mainstream designs with bold colorways and rugged silhouette fitting for all kinds of conditions. ACG attempted to fuse outdoor footwear and athletic sneakers, however, not much attention was given to this line, thus losing to more aggressive brands like the Timberland. The first ACG that features the Nike Air unit is the Air Max Goadome that was launched in 2007. And in 2013, the Sneakerboot collection was introduced that primarily focuses on producing footwear that can endure adverse weather conditions in the city. Nike also wants to offer an alternative to the traditional boots by taking advantage of its expertise in engineering and designing high-rate sneakers. While barely young, the Sneakerboot category is a good gauge of the paradigm shift in the preferences of the consumers in sports and lifestyle. Sneakerboot users are expected to shoot up in numbers in the coming years as wearers’ needs begin to diversify. The Nike Air Wild is one of the latest offerings of the Nike Sneakerboot. It is taken from an early ACG model back in the 80s. It features an aggressive rubber lugged outsole and slip-on bootie construction upper. Although it looks more like a trail footwear, Nike made this stylish and fashionable to be worn on the city roadways. This sneaker has a water-resistant feature and a superb trail grip. Nike attempts to balance the contemporary and retro profile to maximize the marketability. The low-top silhouette of the Nike Air Wild showcases a trail aesthetics and rugged features with a comfortable fit for its wearers. It has a thick and serrated rubber sole that is fashionable enough for the city pavements. The synthetic and the textile upper with some leather accents gives a luxurious appeal to this tough sneaker. To make it more rugged, Nike finished the entire look with the ACG-esque lacing system. Most wearers don the Air Wild with activewear, joggers, skinnies or shorts and finish it the entire look with a shirt or oversized sweater. The Nike Air Wild is available in men’s sizes from 6 to 15 US in medium width. This pair generally runs true to size. It has a slip-on bootie construction with the traditional lace-up closure for a snug fit. The most eye-catching feature of the Nike Air Wild is the articulated thick razor tread which was inspired by the classic Nike trail footwear. This semi-translucent rubber sole is responsible for superior grip for the outdoor trails and also for the city pavements. It also features thick molded external heel counter that adds added protection. The upper of the Nike Air Wild is made of neoprene material with bootie construction. It has an Injected unit midsole for lightweight cushioning. The reflective mudguard is present that enhances the visibility of the kick during the low lights. The solid rubber outsole features aggressive lugs inspired by iconic Nike trail shoes for durable traction. It has a foam sole with a Nike Air unit in the heel that provides lightweight cushioning.